The new AC standard is here, with up to 866Mbit datarate and 256-QAM modulation and 80MHz channels. 802.11ac opens up new possibilities and speeds never possible before. 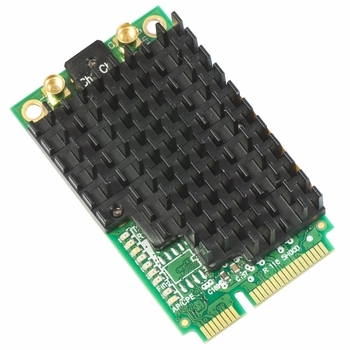 R11e-5HacD is our new 802.11ac card in miniPCIe format, perfect for any RoutrBOARD with miniPCIe slot, such as RB953, RB912, RB800 or x86 devices with RouterOS. The card features built-in LED indicators for wireless mode, connection status (connected, searching, disabled), TX and RX activity and wireless signal strength - just looking at the card will help with installation and alignment.